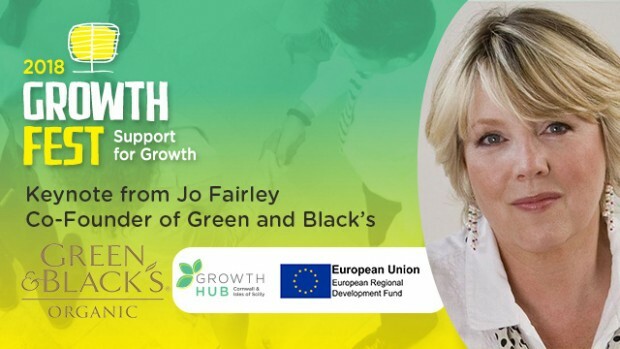 Co-Founder of internationally renowned chocolate brand Green and Black’s, Jo Fairley, will be giving the keynote presentation to round off GrowthFest – a free business event celebrating the success of business support in Cornwall & the Isles of Scilly. Green & Black’s confectionary brand has grown from a £20,000 start-up to a brand worth £100 million in less than 20 years. Consistently a UK “CoolBrand” Green and Black’s are committed to business ethics, sourcing cocoa direct from third-world farmers and paying a fair price for their produce, becoming the first company in the UK to be awarded the UK Fairtrade Mark. Jo will be talking about themes relevant to the whole local business community, from building a brand that speaks to consumers and growing a company from humble beginnings to ethical issues and environmental responsibility. Jo Fairley will be the highlight of the evening celebration after an afternoon of showcasing success, growth and outstanding talent from a range of exciting businesses. As well as interactive exhibits there will be lightening talks and workshops from businesses that have tapped into the support on offer. GrowthFest is organised by the Growth Hub, an EU funded project that works alongside the Skills Hub to help businesses find the right support and training opportunities to work smarter and grow. The event will be delivered in partnership with the Cornwall & Isles of Scilly (CIoS) Local Enterprise Partnership, who will showcase some of the successes in what has been an incredibly busy and eventful 12 months.